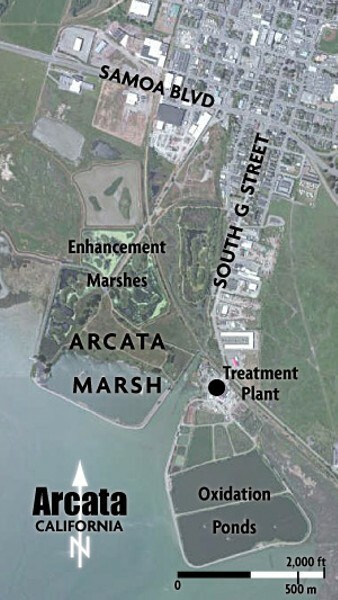 source: City of Arcata Online GIS Portal Arcata marsh and wastewater treatment plant. Halcyon trails wandering around reedy ponds and grassy meadows give little sign of the tumultuous history of the 307-acre Arcata Marsh and Wetlands Sanctuary. Two years after passage of the Federal Clean Water Act of 1972, the State of California prohibited discharge of wastewater into bays and estuaries without "enhancement." Instead of buying into a proposed $25 million regional wastewater treatment plant on the Samoa spit, a few visionary engineers, biologists and politicians saw an opportunity to treat Arcata's wastewater locally, utilizing natural wetlands processes. The ensuing debate morphed into Arcata's decade-long "wastewater wars," culminating in a victory for local treatment. Today, the combined treatment plant and publicly accessible wetlands provide wildlife habitat and recreational opportunities, while purifying the City's wastewater. Primary treatment: Arcata's wastewater initially passes through a conventional primary treatment system. After screening out inorganic materials, raw sewage is sent to a pair of clarifiers (26 and 60 feet in diameter), which settle out most of the remaining suspended solids. These solids are pumped, in the form of a thick sludge, to digesters. Finally, the dried sludge is mixed with chipped yard waste and marsh penny wart to create compost for landscaping. Meanwhile, liquid effluent from the clarifiers is pumped into oxidation ponds for secondary treatment. Secondary treatment: A key measure of the efficiency in a sewage treatment system is the reduction of Biochemical Oxygen Demand (BOD). That's the amount of dissolved oxygen needed to break down organic material (the stuff that makes sewage sewage) into benign liquids and gases. Secondary treatment usually requires removal of at least half the BOD and reduction of whatever suspended solids remain after primary treatment. Arcata's 55 acres of oxidation ponds accomplish this by allowing further settling while promoting algae growth. Algae generates oxygen (taking care of the BOD) through photosynthesis, while simultaneously consuming nitrogen and phosphorus by producing nutrient-eating bacteria and microbes. Tertiary treatment: Arcata's three treatment marshes continue to reduce BOD, as well as removing dead algae and any lingering suspended solids. Chlorine disinfection kills any pathogens in the water, while sulfur dioxide, in turn, removes the chlorine. The treated, clarified, disinfected effluent is now ready for tertiary treatment in three "enhancement marshes," named after three of the visionaries referred to above: George Allen, Bob Gearheart and Dan Hauser. Nutrients in the remaining suspended solids nourish algae, fungi, bacteria and micro-organisms among the roots of the marsh plants, which symbiotically further decontaminate the effluent. Some seven weeks after first entering the treatment facility, purifed wastewater is released into the Bay. Arcata's system has become an internationally recognized model for treating wastewater as a resource to be used, rather than a problem to be overcome. And we walkers, runners and bird-watchers are the fortunate beneficiaries. Barry Evans (barryevans9@yahoo.com) wishes all communities could treat their sewage as ingeniously and efficiently as Arcata does.